Spices and artisan roasters can really do a lot for a cup of coffee on a cold morning – and I’m not talking about adding a flavored syrup to your morning brew. When real spices are added to the beans before you brew the coffee, they really become a part of the drink and give it a lot of depth, rather than just adding some sweetness. Trader Joe’s has Gingerbread and Wintry Blend coffees that include whole spices with their beans, and in both cases the blends work well. It’s just as easy to add the spices at home to whatever coffee you have on hand. 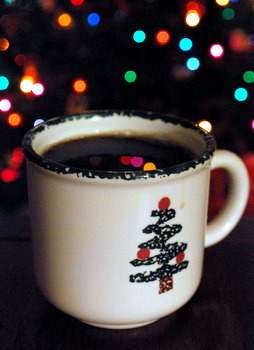 This coffee is a spin on those two Trader Joe’s coffees and is perfect – rich and spicy – for Christmas morning. Use a dark or medium roast so the coffee isn’t overshadowed by the flavor of the spices. If you use whole bean coffee and grind it yourself, you can start with whole spices or pieces of them, like chunks of cinnamon sticks. If you use ground coffee, add a few dashes of preground spices to your grounds before turning on your coffeemaker. This recipe assumes that you’re brewing a full pot of coffee (10-12 cups). I know I drink a lot of coffee on Christmas. Adjust the amounts according to your personal tastes, or for smaller batches. Adding just a dash of each of these spices will make for a nice change, if you want to play on th conservative side, too. Grind the whole beans and all spices in your coffee grinder, then add to a regular drip coffee maker and brew a full pot as usual. If you use a french press, stick with a coarse grind for the spices as well as the beans so you don’t end up with too many bits of clove or cinnamon floating in your cup.